Navasana is an asana. Variations include Paripurna Navasana, Ardha Navāsana, and ekapadanavasana. 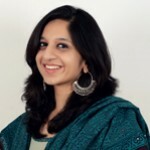 Sanskrit: परिपूर्णनावासन; Paripurna – Full, Nav – Boat, Asana – Pose; Pronounced As – par- ee-POOR-nah nah-VAHS-anna. This asana, if done with great dedication and practice, can be extremely empowering. The Full Boat Pose instills strength and balance in our lives, just as a steady ship moves calmly through the rough seas. The Paripurna Navasana is the full expression of the pose that requires full extension of both the arms and the legs, and the body to be in an acute, boat-like ‘V.’ This asana is often called the Naukasana. It is best to practice yoga in the morning. But in the event you cannot work out in the morning, it is alright to practice it in the evening. To begin this asana, sit erect on your mat, with your legs stretched out in front of you. Place your hands on the floor, making sure they are slightly behind your hips. Pull your body up, ensuring your sternum is lifted. Lean back. The objective is to straighten your back, making sure it is not rounded. Breathe out and lift your legs such that they are at 45-degree angles with the floor. Extend your tailbone, and move your hips close to your navel. Straighten your knees. Straighten and lift your toes to the eye level. Ensure you are sitting on your buttocks and tailbone. Now, raise your arms and stretch them out such that they are parallel to the floor as well as to each other. Make sure your lower abdomen is firm, but not thick and hard. Breathe normally. Hold the pose for 10 to 20 seconds initially, and as you gain practice, increase the time. Breathe out as you release the pose. In case you have neck injuries, use the support of a wall to do this asana. Rest the back of your head on the wall as you lean backward in this asana. As a beginner, to prepare for this pose, you could do this while sitting on your office chair. Sit on the edge of your chair, with your knees placed at a 90-degree angle. Hold the sides of your chair and lean forward. When your arms hold the sides firmly, lift your sitting bones a little off the seat. Raise your heels, leaving the balls of your feet gently touching the floor. Feel the head of your thigh bones pull with the force of gravity as you pull your sternum up and ahead. Caution: Consult your trainer before you do this, and do it only on a steady chair that has no wheels. The Paripurna Navasana is the full pose, and there is no advanced form of this asana. 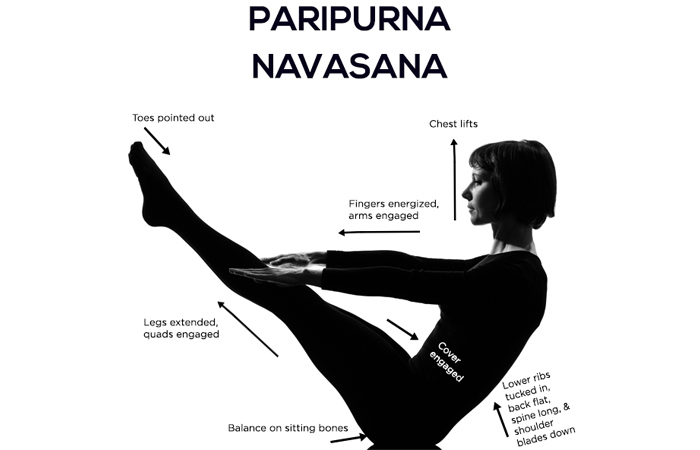 These are some amazing benefits of the Paripurna Navasana. Practicing this asana makes the spine, hip flexors, and abdomen stronger. It helps to activate the prostate glands, kidneys, intestines, and thyroid. This asana serves as a great stress reliever. The massaging of the abdominal organs helps improve digestion. The digestive system is strengthened as well. In addition to working your torso and limbs and making your spine stronger, this asana teaches you a lot about yourself – your breath, your emotions, your attention span, and your nature. With practice, this asana moves beyond your body, i.e., the organs, nerves, bones, and muscles, and penetrates into the very core of your being. This asana requires you to draw your spine, abdomen, chest, shoulder blades, the frontal area of the trunk, and your pelvis to the center as your arms and legs stay firm and steady. When you engage your whole body in the Full Boat Pose, you feel strong, both physically and mentally. When your mind is distracted while you are in this pose, you will tend to lose balance. Make sure to find your stability as you loosen your facial muscles and relax. This is the key to finding stability and balance. Breathe normally. This asana works on the muscles in the core, but it is very different from the crunches you do at the gym. When you pull your ribs away from your abdomen, you learn how to stretch as well as engage your abdomen at the same time. You lengthen the front of your body in this asana, and it is a requirement when you practice Pranayama. This impacts and improves your breathing as you practice this asana every day. There are many actions and a whole lot of effort that goes into perfecting this asana. But if you find that balance, it will help you align and calm your emotions, body, and mind.